Those of you who follow my Facebook page will already know about the devastating wildfire which spread throughout the Cómpeta countryside last Sunday. At the height of the blaze there were more than 200 fire-fighters on the ground, assisted by up to 19 fire-fighting aircraft, including helicopters, water-carrying planes, and spotter aircraft. 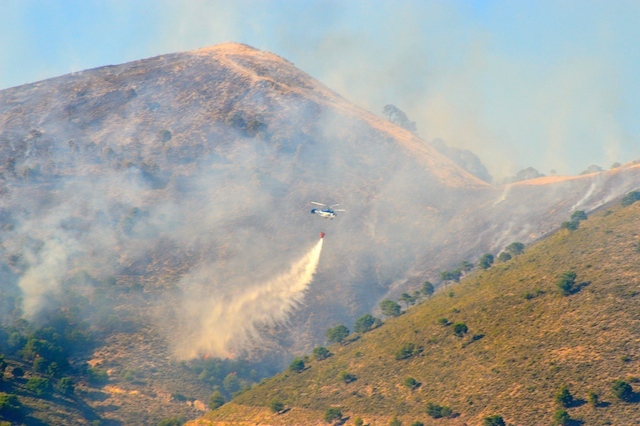 Personnel were drafted in from the whole of Málaga province and beyond, to the blaze which started around 1pm, but quickly spread over an area of 100 hectares (250 acres) into the Sierras de Tejeda, Alhama and Almijara Natural Park. Five houses were damaged and the local football pitch destroyed during the day, as well as 500 people being required to evacuate their homes overnight. Fortunately there were no injuries reported. Rumours are rife that the fire was started either maliciously or as a result of “bad agricultural practices”, but whatever the truth, it was a frightening experience for many local residents and visitors, alike. You can read Maggie’s account of being caught up with the evacuation HERE or see Adrian’s photos of the aftermath of the fire around Cruz del Monte area, where residents were evacuated, HERE. Below is a collage of some of the photographs I took throughout the day. If you live in a forest in Spain or within 500 metres of one, you are required by law to have a fire prevention and self protection plan in place, just in case a fire should occur. It’s a sad fact of life, that only around one quarter of all forest fires are started by natural causes, such as lightning. The rest are as a result of negligent practices or intent. 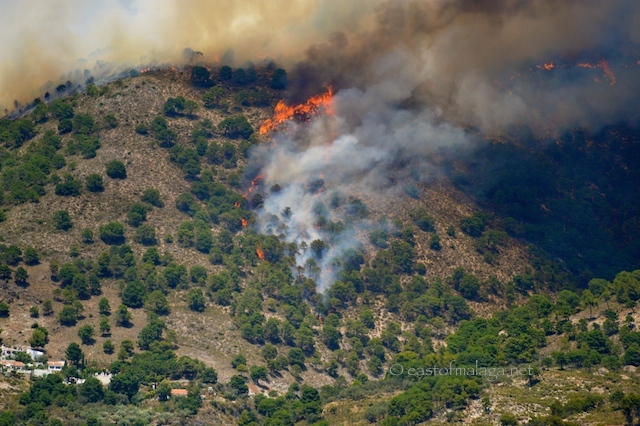 So, it makes perfect sense that if you are visiting or living in the Andalucían countryside, you should be in a position to consider your options, if you are caught near a wildfire. Many of the local people have been aware of fires in the countryside all of their lives, but wildfires are not something that many visitors or expats have ever had to deal with, coming as many of us do, from wet, northern European countries. We are unprepared. Have a safe zone around your house, where there is less vegetation. Keep that area free of dried grass, weeds or other flammable materials. Cut back any branches of trees that overhang your house. Pay particular attention to discarded garden prunings and wood stores, making sure they are a safe distance from the house. Keep gas bottles either within the house or in a safe place some distance away. Don’t allow dead leaves to accumulate on your roof or gutters. When outside, ensure that all lit cigarettes are completely extinguished before you leave them. Never BBQ near to trees or flammable materials, and always have the garden hose nearby. BE PREPARED! Prepare an advance plan with your family, considering what you will each do in the event of fire and how you will communicate with each other. Also think about how your pets fit into your plans. Review all your possible emergency escape routes, making sure they are never blocked. Always have at least one quarter of a tank of fuel in your vehicle. Prepare a list of items to be taken in an Evacuation Pack. Call the TOLL-FREE Emergency telephone number 112. DO NOT ASSUME THAT SOMEONE ELSE HAS ALREADY CALLED. They may be thinking the same thing. If you can’t speak Spanish, ask to speak to someone who speaks English. Close all doors and windows in your house. Bring all flammable outdoor chair cushions inside the house. Make safe any exterior gas bottles. STAY CALM and follow your escape plan (if necessary), taking with you your Evacuation Pack. What should be in an Evacuation Pack? Personal papers – such as passports, birth and marriage certificates, house deeds or rental contract, medical cards, insurance policies. Photographs – either in albums, on flash drives, external hard drives or portable computers. Also take any charging cables you may require. Medication – paper prescriptions (if you have them), pills, or items kept in the refrigerator such as insulin. Money – enough to tide you over until you can visit an ATM. Emergency food, water and clothing – including snacks, pet food, baby formula, nappies, sanitary items, bottled water. Battery-powered radio – to listen to emergency bulletins on local radio station. Mobile telephone (and charging cable) – complete with contact telephone numbers and addresses. Irreplaceable precious items – but only small ones that will not hinder your escape. If you live in Málaga province, you might also consider joining the excellent Local Fire and Weather watch group on Facebook, covering the Costa del Sol and inland areas. I do not hold myself out as an expert on fire prevention and consider many of the above points to be common sense. If you can think of anything I have missed that you consider important enough to be included on this list, please let me know in the comment section. Please follow East of Malaga on Facebook – there are many more photos and posts on there each day that never appear on this blog. Look in the footer at the bottom of this page to “Like”. 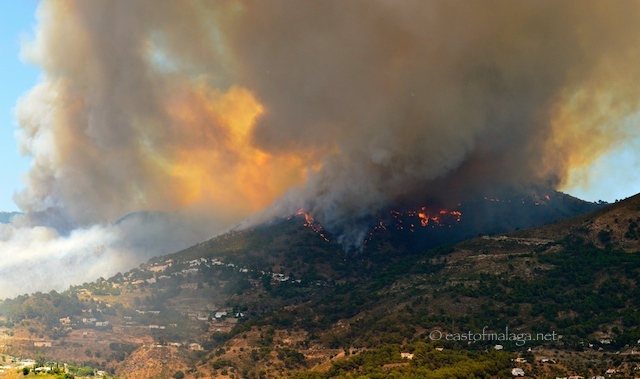 This entry was tagged Andalucía, East of Malaga, Europe, fire, fire prevention, forest fires, Malaga, photography, Spain, travel, wildfires. Bookmark the permalink. Amazing pics Marianne which show the intensity of the blaze! Must have been very frightening to be nearby but glad to hear no one was hurt. I was having lunch with family and friends at Avalon restaurant in Nerja when this incident happened and we could see the smoke coming from the hills. When I returned to my apartment at Chiminea later that afternoon the balcony was covered in ash, as soon as I swept it more came down. When I walked with John Keogh in September he pointed the area out to me. I understand – it’s always difficult to “like” such a post. It IS ironic, but often great beauty can come out of something bad – whether it’s physical or inspirational. At the very least, I hope some lessons have been learned. Ugh how awful. 😦 I forget that Spain is prone to wildfires due to the dry, arid climate in some parts of the country. We get wildfires regularly here in the US too, notably in California and Arizona (but they occur nationwide). We don’t really get wildfires where I’m from in NY, we have the opposite problem (hurricanes and flooding). …and, of course, they get terrible fires in Australia too, Amelie. Oh dear! How devastating! Your pictures show quite the intensity of the fires! Living in Australia, we experience similar in summer but what is frustrating and really concerning is when the fires have been intentionally lit. Why anyone would do such a thing is unfathomable. Anyway, glad to hear that it is at least contained & your post is fantastic in reminding everyone to be vigilant and prepared especially when living in the areas vulnerable to such fires. We are thinking of everyone who has been affected. Absolutely right! How anyone could do such a thing is unfathomable. You know, after seeing these fires here, I wrote the post as a reminder to myself to be prepared, but it seemed sensible to share it. OMG, how terrible! Has it been under control? Oh yes – these photos were from last Sunday, but it took a couple of days before it was finally extinguished. It will be a long time before the beauty of the Natural Park is restored though. Sadly. Thank God it’s extinguished! Hope rain will come soon. Btw, we have had 4 year drought in TX, we know the danger of fire, this is a better year. 4 years – wow! It pays to be extra vigilant, especially during the hot summer months. How terrible! My parents live in the mountains of Arizona which a lot had been ravaged by fires. It always is so sad to see the destruction and all the burnt trees. I hope the fire is contained soon. I hate looking at all the loss. It always is so sad. Was the fire due to humans or a natural cause? It has been raining way too much here in Minnesota and we are flooding! They haven’t announced the actual cause, but it is said that the fire was caused either maliciously or negligently. That is always the worst cause of a fire. You feel somewhat better when it is due to mother nature versus human ignorance. Oh my, that looks scary and too close for comfort! You did a great job compiling that exhaustive list of dos and don’ts Marianne. Thankyou Marianne, for your ‘easy to read’ advice and fantastic photo’s. We were on the fringe of the Malaga fire and it was pretty scary! Just one thing to check, it is not only irresponsible, but I think it is ILLEGAL to have a BBQ or Fire Pit in the Campo areas during the summer months, which not many holiday makers are aware of. How dreadful! So glad no-one was hurt, and that the fires were extinguished quickly. Great advice, Marianne. The emergency services were amazing – they worked so hard and in very difficult circumstances. One has to really admire these heroes. Absolutely! It’s SO much more than just a job. You know, nature is amazing. After less than one week – from a distance – many of the burned areas are hardly noticeable. Incredible. I know it’s a different matter close up though. Oh wow, that is sad. Is it like that every year? Or is it particularly bad this year? It’s the wildfire season during the summer, but it does seem worse this year. This topic is relevant to Australian bushfires too. Your information is valuable, and can’t be too widely circulated. Stay safe. OH absolutely – and there are often wildfires in California every summer, too. Same advice the world over. What I worry about is that many foreigners who have made Andalucia their home (or are on holiday in the area), have not grown up knowing the dangers of these kind of fires, and simply wouldn’t know what to do. Nor might they understand instructions and information given in Spanish – so this post is merely a guide, in English. Sounds just like summer in Australia. Every summer some idiot starts a fire that burns for days and kilometres. In the past few years, we’ve been receiving official advice on TV and radio etc, to start cleaning up dried vegetation and rubbish in spring, long before the fire season is on us. Thanks for your list of things to pay attention to, Marianne, there were a few new ones for me. You’re welcome. It makes common sense not to smoke or BBQ near to tinder-dry vegetation doesn’t it Trish. What’s the matter with these people? You’ve got it in one, Meredith. What concerns me is that many expats or visitors to the area are not familiar with fire procedures, or haven’t got the knowledge of the Spanish language to know what to do. I am so glad you weren’t threatened with this Marianne. Having grown up in Australia where wildfires are so rampant and occur on such a regular basis I sympathise with all those who were having to deal with this. It’s always a worry in the summer months, Jo – and this year is a hot one. Glad you’re safe, Marianne. I hate this time of year for this very reason. I’m surrounded by eucalyptus forest and it’s impossible to clear the obligatory 50m radius of land around our property because of steep slopes. I get nervous whenever I smell smoke and furious when I see people tossing cigarette butts out of car windows. Thanks for sharing this post – it’s a timely reminder for me to get my emergency pack in place. 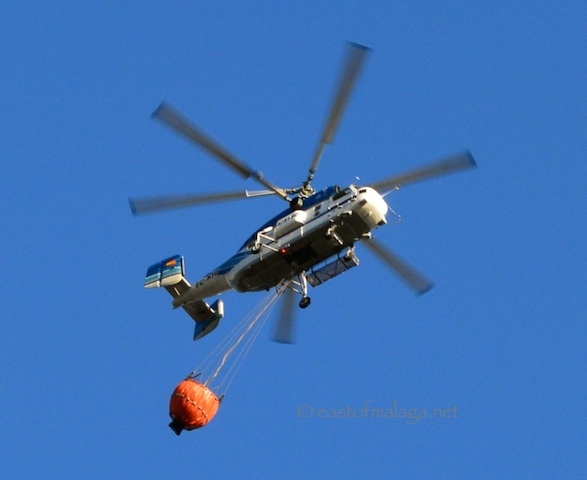 Often, the first thing that alerts us to a fire in the area is the dull thud of an approaching helicopter. There are no light aircraft pass overhead here usually, so we always know there is something wrong when we hear that sound. It’s always worth considering an escape route (and what to take with you) when you live in the countryside like you and I do, isn’t it, Julie? Glad you’re safe. Your pictures show a countryside that’s beautiful in even in a wildfire! Only one thing I ask Marianne…. Stay safe please. I’ll do my very best, David. The fire was finally extinguished on Monday (or was it Tuesday?) – anyway, it’s out now. I’ve heard reports that people more than 20 kilometres away were having ash falling into their swimming pools! Really informative Marianne, I hope you never need to use your evacuation pack. Hmmmm …. me too, Gilly! It’s good to be prepared and to consider what might happen. Sure beats getting caught unawares. Oh my! Do keep safe! It was last weekend, Seyi – the fire is extinguished now. Just thought it would be helpful to remind everyone (myself included) of what steps we can take to prevent fires and help ourselves in the event of a wildfire. It pays to have a plan, doesn’t it? Oh my goodness how frightening!